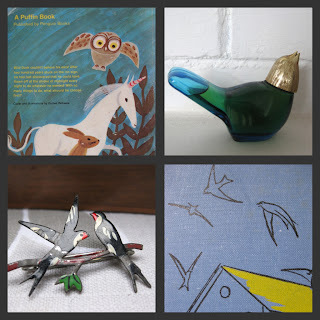 Hello Crisis-devotees, I'm Nath of le petit oiseau fame and my collection and obsession with birds is pretty much what got me into blogging, see here and, oh here. So, fittingly, I'd like to show you lots of beautiful birds. How does that sound? Right-ho, then here we go... We've established I like birds and so it seems I'm not alone, birds are all over the interweb like, erm, bird flu. Owls - the bird du jour, or is the owl a bit over? Not for me, I love 'em. 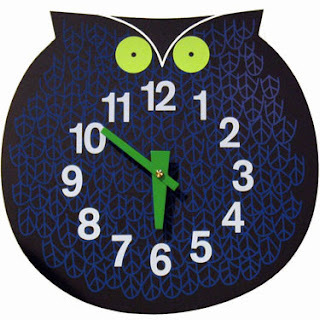 George Nelson designed this owl Zoo Timer clock in the 1950s, inspired by a night of doodling with Noguchi, you know, as you do. Ostensibly for children, but I say why should they get all the fun? One of these would add a quirky graphic touch to any room. 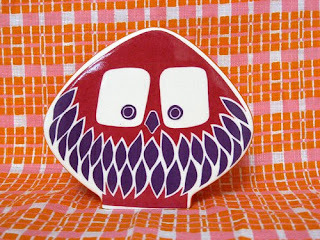 Or how about one of these owl money boxes by Carlton Ware, designed in the 1960s. Isn't he super-groovy? I can't think of a more deserving place for all my small change. Three in a row would be so dandy (and expensive)! And, I'd sure like to get my hands on one of these owl mugs, by John Clappison for Hornsea in the early seventies. 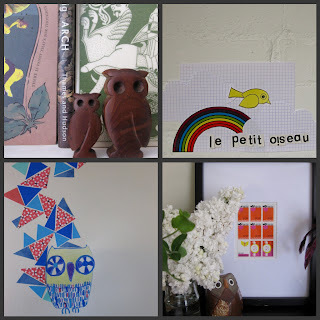 Try H is For Home or ebay if you'd like to sip your morning herbal out of an owlish mug. Looking around I came across this place, they sell 'fused light with a naturalist curiosity'. This owl nightlight would make a sweet and soft addition to any child's room or nursery. 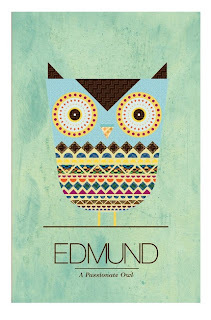 For your walls, why not try Able, a design and branding firm outside Philadelphia who also design these handsome posters - here's Edmund - A Passionate Owl. Perhaps you'd like your owls a touch more realistic, but still with vintage credentials? Look no further than this incredible resource. Ladybird book were a staple of my childhood, they covered a wide variety of topics from hobbies and crafts to travel and represent a social history of Britain in the 50s and 60s and now you can buy these beautiful illustrations as prints of all sizes. 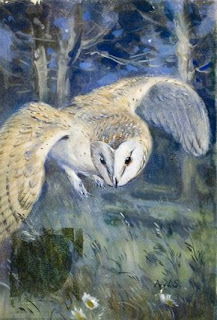 The barn owl here is taken from A Second Book of British Birds, published in 1954. 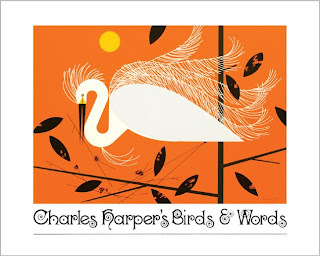 Is it possible to do a post on birds and not mention the mighty Charley Harper? It seems criminal not to. His work has received a lot of recent attention, but it doesn't diminish the power of his work for me. 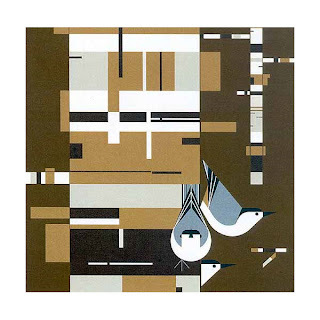 In a style he called "minimal realism", he captured the essence of his subjects with as few as possible elements. And boy, did he. 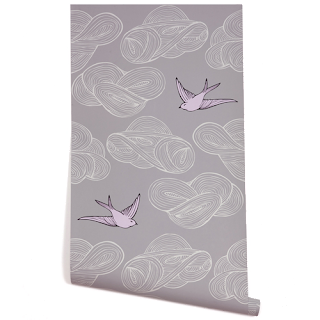 Speaking of walls, wallpaper can be a good way to add an avian accent to a room. We have this in our bedroom. Weirdly, I didn't realise that they were peacock feathers at the time of purchase. I know, wtf? But, it's okay, I do now. 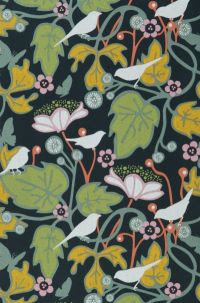 I like this paper too, it's Daydream by Julia Rothman, it's been doing the rounds in blue, but I rather like the muted softness of the pinkish grey. This would work well in a bedroom, transforming it into more of a dark and sultry boudoir.. Available here for a very reasonable price. So, did you enjoy that little fly-by posting? If you're hungry for more, why not follow my blog or check out my shop? 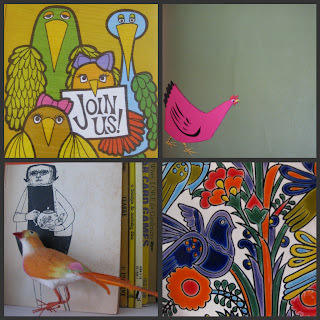 Until the next post, then, I'll leave you with a little best-of compilation of some other birdy treasures around my home. Thanks to Erin and Karly for having me over - it's been a lotta fun!